Students can use this organizer to gather quotes from three different sources. I usually allow them to pull one quote from "Flowers for Algernon", one from the article, "Designing Life: Should Babies Be Genetically Engineered?" and then a source of their choice that I approve of. 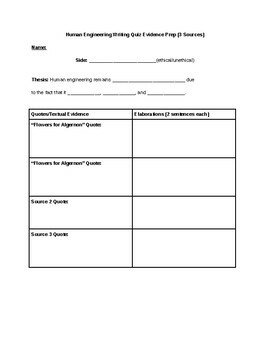 This document enables them to organize their evidence before putting it into formal writing.